Curator Kim Knoppers interviewed each of the participating artists in Foam's current exhibition, Alumni of the Rijksakademie. Here, she talks to Gert Jan Kocken about his work in the show. Do Depictions of Berlin and Battle of Berlin, two of your recent works included in this exhibition, originate from your previous work? Years ago, I started a series about historical turning points because it is at those times that images or representations are under pressure. A good example of this was during the Reformation, when a discussion arose based on the second commandment about the idea of 'images'. But there are also other times when images, in the form of paintings or sculptures, come under fire because they serve as representations of symbols of ideas or power. For me, it's about rethinking things in a broader whole, in a new context with different relationships. Your gaze in this is leading. Your working method allows things to come together in a way that could not be accomplished by someone else. How important are these combinations? I think it is interesting to place two works next to one another with space between them for contemplation. An explanation of the pieces is provided, but I also leave a lot open to the viewers' own interpretation. It's also possible that nothing will happen for the viewer, and I accept that too. But the texts usually prompt viewers to think about the events in their own way. I photographed a watercolour (Alt Wien, 1908, (Washington 2005)) and the text states that Hitler had applied to the art academy in Vienna but was rejected. People then immediately think: "But what if he had …". The text doesn't state this, but people think of it themselves, even though the idea is pretty much implicit. The works are a part of a series of composite maps that you are working on. How did this series come about? At a certain point, I stumbled upon a map depicting the city of Ypres. This map had hung in a British army office for four years, and was used during this time to mark where battles were being fought. Ypres was totally destroyed during these four years, and it was also totally obliterated on the map. Time became visible in a single image. I was then asked to work on a project, Warzone Amsterdam, about a possible war in Amsterdam in 2030. I wanted to show the meaning of this for the city and its residents by showing what had happened in Amsterdam during the Second World War. By layering all the maps used by the different parties during that time on top of one another, the entire war and all the information are condensed into a single image. The specific meaning of the Second World War for Amsterdam becomes very clear when you compare it to another city. So I made a map of Rotterdam first. In Amsterdam, the persecution of the Jews is the main thing that is remembered, but in Rotterdam, it was how the city was bombed. But then I thought, I need to do Berlin as well, because that's where the Second World War ended for the West. I initially thought that it would be interesting to layer maps from the Russians, Americans, British, French and Germans, all the parties involved. But it turns out that all the notes on the maps in different languages make the whole thing unreadable. At that point, I decided to make two separate pieces. 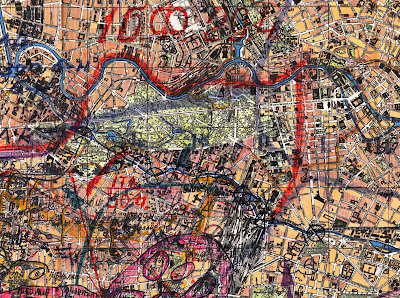 Depictions of Berlin is a composite map of the German and American offensives. In this map, there are actually four subjects that are very important: the megalomanic building plans for Germania, the consequences for the Jewish population (Judenreine Gebiete), the division of Berlin into sectors during the Yalta conference (creating American, British and Russian sectors, which would later be separated by the Berlin wall), and also the consequences for the residents of Berlin. I used maps showing the destruction of the buildings caused by the Allied bombing and the Russian invasion. 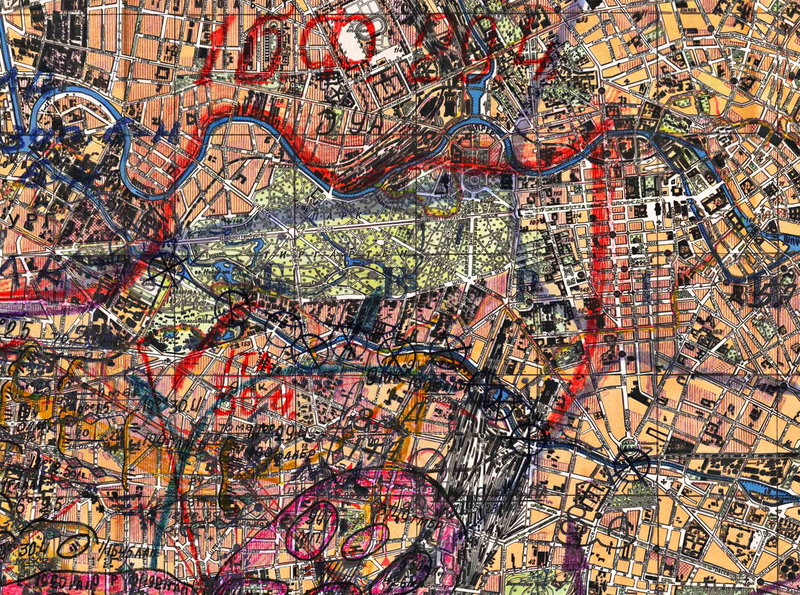 The other map Battle of Berlin is composed only of Russian maps. It shows the Russian invasion in the final weeks of the war. I am currently working on a version for Rome. Italy was Germany's ally during the Second World War and is the birthplace of Fascism. I am interested in images, but maybe it's better to say I am interested in how something is depicted. However, I don't think that necessarily needs to be accomplished by means of photography. What is important for me is the relationship between the image and the subject, a two-dimensional representation that can be viewed in a new context and in combination with other images. When you attended the Rijksakademie, you were already quite accomplished as an artist, and you had developed a very personal working method. Why did you want to go to the Rijksakademie? I wanted to study how I could combine text with my images, the relationship between the two. At the Rijksakademie, I made a piece that incorporated text in glass, and a piece that revolves around notes: text as a part of the work. For me, art is about continually searching for new ideas and new combinations. The workspaces at the Rijksakademie are very professional. The academy has specialised people who focus only on questions from artists: people who are used to helping artists look at all the practical possibilities of an idea. Having someone who works with you to figure out how to do something differently means that you can take huge steps forward. It is fantastic to see the work that has been conceptualised and executed in recent years. The exhibition, Alumni of the Rijksakademie - RE-Search, is on from 31 August - 14 October 2012.